I have had this book on my shelf for a while now. I have been so busy that I forgot it was there. Then I was talking to my coworker and she said "OMG you have to read this book, now." So I just finished this book and it is 2am. I am overwhelmed with emotions right now. It feels like half of my heart is hurting and the other half is filled with so much joy. I am not going to go into details with you because this book, this story deserves to be read with fresh eyes. I will share this...and this was a heart-stopping moment for me. After reading this I turned to my husband and just asked him to hold me and he did with no questions asked. "In the future...if by some miracle you ever find yourself in the position to fall in love again...fall in love with me." He presses his lips against my forehead. "You're still my favorite person, Lily. Atlas said that to Lily and right then and there I knew that this book was more than just a book to me. Colleen Hoover you are an amazing writer and I just want to say thank you for writing this story. You have touched my heart more than you will ever know. 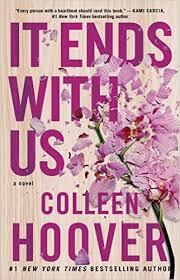 Mrs. Hoover's highly anticipated novel, It Ends With Us, releases August 2nd, 2016 and is currently available for preorder. For tour dates or more information, please visit www.colleenhoover.com.